Stadium comes first, and then comes the team. Built in 1947, Santiago Bernabeu has turned into a legendary battlefield hosting Real Madrid C.F. The stadium depicts club’s glorious history and is the home of 81,044 of its dedicated supporters. Who is the owner of Santiago Bernabeu? Real Madrid C.F. It took three years to build Santiago Bernabeu. Construction works were launched in 1944 and ended up in 1947. The stadium initially had only two uncovered tiers that hosted up to 75,000 supporters. The former president was eager to increase the arena’s making it 125,000 seats. After the construction works were over, the stadium got the name of its predecessor. Later it was named after the club’s president. Premium or Superior seats on the sides opposite each other. Cat 1 seats are located on the upper side tiers above the premium seats. Cat 2 seats are located from both sides of the arena behind the net. 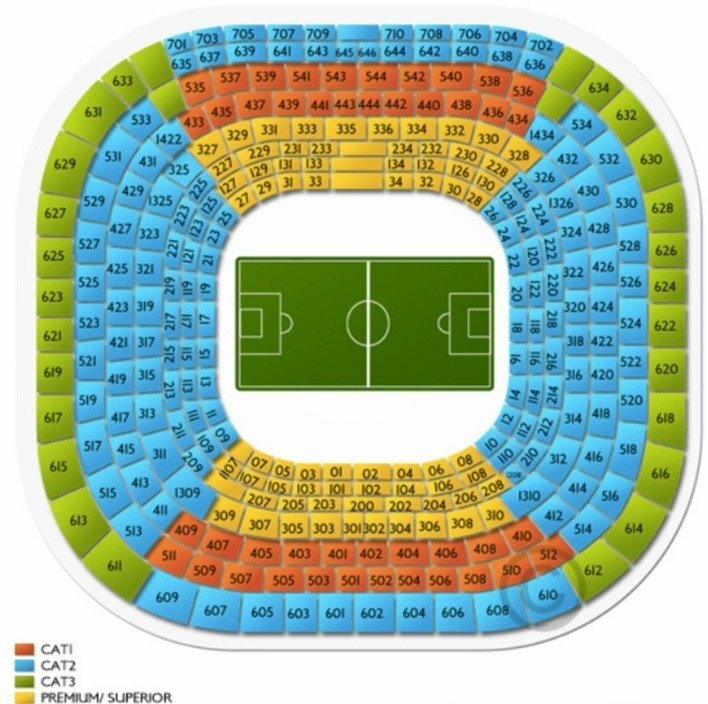 Cat 3 seats are the cheapest ones located on the upper tiers above cat 2 seats. Santiago Bernabeu is the second biggest arena in Spain. For many years, it has been hosting major football events including UEFA Champions League finals with the record attendance of 125,000+ visitors during the match between Real Madrid and AC Milan back in 1956. StubHub is a timesaving solution whenever you want to buy tickets to Santiago Bernabeu at a reasonable price. The service boasts intuitive interface, advanced navigation, and other great features to ensure the most amazing matchday experience on one of the most spectacular arenas in the world. By phone – +34 902 32 43 24. As a rule, tickets for categories 1,2 and 3 get on stock a week before the matchday. VIP and Superior tickets are available even earlier. The prices for the seats behind the goal net start from €30.00m while seats on the sides are from €40.00 and higher. Traveling to Madrid is always a great experience whether you come here to see the match or review the major places of interest. Make sure you have a place to stay for a night. Booking.com will make all necessary arrangement for you. Sort out some of the best accommodation options by filters and benefit from the great location and affordable prices. You can also save your time and simply choose a place to stay from our lists below. Hostal Falfes – located next to the Estrecho metro station, the hostel offers cozy twin and double rooms with shared bathrooms. It will take you about 10 minutes to walk to the arena overviewing picturesque surroundings. The price per room starts from € 34.04. Village Residencial Don Quijote – the hotels was named after a famous character created by Miguel de Cervantes. Alvarado metro station is very close to the venue. Palacio de Congresos de Madrid is located 900 meters from the hotel. It will not take you long to get to the arena as well. The offer looks good considering € 40.50 per night in a triple room. Far Home Bernabeu – a typical European hostel with shared beds in one room although very clean and tidy. The venue boasts a great location right in the Tetuán district where Santiago Bernabeu is located. Prepare to pay € 45 for a double room with a shared bathroom. Hostal Suárez – modest price, good location not far from the stadium and nearest metro stations, private bathroom and air conditioning make this hostel a #1 choice for only € 45 per night. AC Hotel Aitana, a Marriott Lifestyle Hotel – located only 250 meters from Santiago Bernabeu, the hotel is a part of Madrid’s prestigious Paseo de la Castellana. If you are not in a match, you can visit the Congress Palace located just opposite the hotel. It hosts different entertaining events. The price for a double rooms starts from € 182.33 per night. H10 Tribeca – although it is not far from the arena, the hotel is located in the heart of the business borough of Madrid. It boasts stylish rooms with all modern facilities you may need for a comfortable stay after the match. Moreover, it is not far from the international airport. The price per night here starts from € 130.50. NYX Madrid – it will take you only 10 minutes to walk to the Real Madrid’s arena from this hotel. An economy room will cost you from € 98.10, which looks like a good price for high-speed Wi-Fi and flawless 3G connection for your mobile devices to stay connected. The stadium has a great location from visitors’ perspectives. It is situated in the central part of Madrid not far from the downtown. The city offers plenty of different options to get to the stadium using various types of public transport. Santiago Bernabeu is not far from the city’s business district and heart. For this reason, you will never face any difficulties in reaching your destination. By Tube – metro line 10 is the best variant for those who want to avoid traffic jams and congested roads, especially on the matchday. Santiago Bernabeu metro station is the nearest station to the arena. It will take you a couple of minutes to walk to the stadium from there. Columbia ad Tetuna stations are also not far from Santiago Bernabeu n case you have some free time to walk. By Bus – two bus lines are passing through the arena making a stop not far from the stadium. They include buses #14 and 27. You can take them in the directory of Plaza de Castilla. By Tram – Plaza de Lima is the nearest tram station located right next to the stadium. You can take a tram that takes off from Callao metro station. By Plane – the majority of international flights arrive at Barajas international airport located about 12 km from the stadium. You can take a bus right from the airport or follow to the nearest metro station. Parking close to Santiago Bernabeu can be tricky. It’s especially true when a big game is about to start in the capital of Spain. However, there is always a solution. The approximate matchday paid parking price near the sports venue in Madrid is €10. The Spanish capital is famous for its restaurants and cafes serving local authentic cuisine. At the same time, you can easily find venues featuring continental and Mediterranean meals. Visitors can choose from a variety of seafood, meat, and wine, of course. I have conducted a list of some good cafes and restaurants located near the stadium. The Irish Rover – the bar brings the authentic spirit of Ireland to the heart of the capital of Spain. A traditional Irish pub will amaze you with a selection of classic beers. Try local stouts and IPAs to warm up before the match. Iciar Café – a smart and clean venue where you can have a snack after a long day of walking around the city. The menu includes burgers, sandwiches and cold drinks perfect for refreshments. Café-Bar Quintá – a classical Spanish café with affordable and fast meals to have a snack. Keep in mind that the portions here are huge! You can easily share one sandwich with your mate. Cervecería José Luis (Habana) – a cozy restaurant that will make you feel at home. The pleasant interior is a good addition to an extended menu featuring meals that taste great. Restaurante José Luis (Becquer) – a posh Spanish restaurant that serves traditional Spanish cuisine. Grab your chance to try local appetizers before the main course with a glass of local wine. Real Madrid boasts a rich history and has plenty of interesting things to show off. The stadium offers different programs for all tastes at the most reasonable price. The local museum is the only place that compiles the glorious club’s history throughout the 20th and 21st centuries. Real Madrid team bus and more. The excursions are available from Monday to Saturday. The opening hours are from 10 am to 7 pm. Please, note that all stadium tours are unavailable 5 hours before the match. The museum of Real Madrid FC is included in the program. It keeps the teams glorious past. Here you can track the history of victories as well as see some of the iconic trophies with your own eyes. The price per ticket starts from €18. Feel free to book tickets in advance using a simple online form. Located right at Santiago Bernabeu, team’s fan shop is your door to the world of Real Madrid and everything connected with it. From sports and training kits to Bale and Ramos jerseys, you can find everything you need on over 1,500 m² on three floors of the official Real Madrid merchandising. It is not just a shop. A place brings sport lovers, club’s fans and technological geeks together. From sprawling museums and galleries to authentic Spanish restaurants and cafes – Madrid is a real godsend for tourists craving for different types of entertainments. You will; explore numerous interesting places that hide on every corner. Breathtaking cathedrals, amazing architecture, cultural monuments and modern art meet together in the capital of Spain delivering the best tourist experience. Once again, city buses are the best variant for overviewing the city with its major attractions and places of interest. The price per tour starts from £10.58 per adult. You will have a chance to visit the old part of the city as well as get to the center of Madrid shopping and fashion. Buses depart every 30 minutes making it easy for you not to miss the tour. All executions are available from 10am to 7pm. The market of San Miguel – it is the heart of Madrid as well as its major shopping and grocery center. Here you can feel the spirit of the capital and experience its rhythm. You can buy seafood, a variety of meats and other products that can be cooked right here on the market. Royal Palace of Madrid – you should visit this place not just because it is the residence of the royal family but also because the building itself is very beautiful. Mainly used for state ceremonies and social events, the palace is the signature of the city. Puerta de Alcalá – this one is the most popular Madrid monument. It was built specially for King Charles III in the form of a massive neo-classic road gate that looks overwhelming especially at dusk.